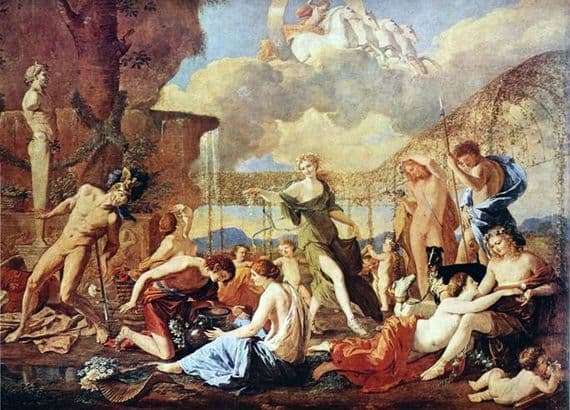 One of the most famous works of art by Nicolas Poussin “The Kingdom of Flora” is poetization of images made in painting. Over time, the colors in the picture faded a little, but initially this masterpiece work of art radiated light. This is confirmed and now, the main thing is to pay attention to the flawlessly blue color of the sky and with what pleasure Appolon rushes on his frisky four in the distance. Paying attention to the central scene of the picture, it is impossible to leave unnoticed the prim Herm, the ancient god who guarded the gardens, brought fertility. Before us is a tree figure, just such herms were set in ancient times. Next we see a tree entwined with greenery, emerald jets of a fountain. In the background is a pergola, around which greens and flowers hover. In the center of the picture in front of us, in a graceful dance with a beautiful floral wreath on her head, the goddess of spring flowering Flora ceased. In the foreground, to the right in front of us are mythical heroes, Smilak, who, as if wraps her beloved Crocus with delicate hands. Behind the couple in love we see Adonis with the dogs, he holds a spear in his hands. Adonis is mortally wounded, but he rather calmly considers his wound. After his death, at the request of the beloved Aphrodite, gorgeous anemone flowers grew from the drops of his blood. Geozint is located to the left of Adonis, he was killed by an iron disk from the hand of his friend Apollo. Appolon, being in grief, turned the drops of his friend’s blood into geozint. Geocinth depicted in the picture with sadness examines these flowers. On the left, in the foreground in front of us is a narcissist Narcissus, admiring his reflection and the nymph Echo, holding an amphora. For Narciso, we see Cletiaus, who according to legend was punished by her father for adultery. She sat motionless for a long time, day after day watching the movement of the sun, after she had grown into the earth and turned into a heliotrope. The image, which is located at the extreme left, is Ajax, who in a fit of madness sent to him by Athena chopped a herd of bulls, waking up the soldier did not bear the shame and killed himself with a sword. It is impossible to lose sight of the Amur round dance, faithfully following their goddess Flora, who showered her guests with beautiful flowers.